The Highland Clearances, sometimes in Scotland's history just referred to as 'The Clearances', were a period of huge social upheaval throughout the Highlands of Scotland. Some commentators interpret the evictions that took place as a form of ethnic cleansing. Other historians see the uprooting of a native population as inevitable, given the changing economic and political climate in the north that gained momentum towards the end of the 18th century. The change and disruption to Highland communities and the creation of the emptiness we associate today with large tracts of the Highlands – the picture below is of Glen Callater, Aberdeenshire – took place as landowners found new ways of making money from their land. This necessitated re-settlement of tenants cultivating communal land. The native people, with their Gaelic culture firmly embedded in the places where they had lived for generations, had little say in the new regime. They were either forced to move to Scotland’s cities to find work, to emigrate and start again in the New World, or they were sometimes allocated coastal marginal land in order to clear the inland grazings for the estate owner’s sheep – at the time regarded as profitable and innovative in farming terms. The new coastal settlements were intended to be sustainable through fishing and kelp-gathering. (The kelp or seaweed was processed and used in chemical and soap making industries.) When these activities proved to be unsustainable, a further wave of emigration followed on. Some of the emigration was voluntary – a circumstance remarked upon by James Boswell, touring Scotland with the English lexicographer Samuel Johnson in 1773. On Skye, for example, he records in his Journal ‘We performed, with much activity, a dance, which, I suppose, the emigration from Sky has occasioned. They call it America. 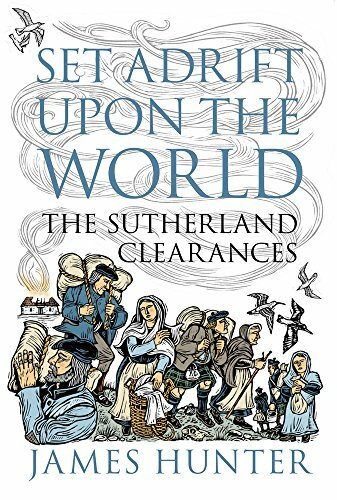 Aside from voluntary emigrations – and not all Highland landlords were tyrants – many episodes of the Highland Clearances were carried out with much brutality – for example, the forced removal of tenants irrespective of age or infirmity, and the burning of their townships. Helmsdale, at the coastal end of the strath, grew from a 'planned village' of 1814. In any tour of these northlands it is worth taking the short walk from the roadside down to the site of the Clearance village of Badbea, north of Helmsdale. It was settled by cleared Highlanders from the neighbouring straths. They were forced to build new homes here. It is said their young children had to be tethered in cased they strayed near the cliffs. Badbea’s location on the open ground above rugged cliffs is obviously very exposed. In the pictures here, the white dot half-hidden by bushes on right of picture is an interpretation board, while a ruined gable end is all but swallowed up by the flowering gorse. Other parts of Easter Ross also saw violent evictions, while it is even said that many with the name Sutherland, whose families to this day live along the south coast of the Moray Firth, all came from the cleared settlements along the north side of the Firth. He was actually charged with arson and homicide, as his men set fire to tenants’ houses in Strathnaver with old people still inside them. He was acquitted. In any case, a guidebook to Dunrobin Castle, printed as recently as 1991, explains it differently. ‘Much the same thing is done today by town councils who uproot people from their old shabby but neighbourly streets and place them in ultra-modern, clinically clean but often high-rise flats, usually against their will’. That crass piece of insensitivity should be reason enough for any of you with the slightest socialist leanings to give this least stately of stately homes a miss! 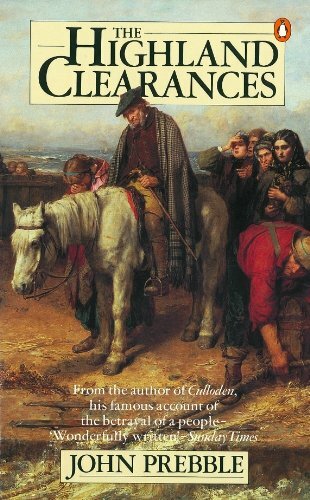 This page provides the briefest of introductions to the episodes of the Highland Clearances, which were widespread right across the Highlands. The Isle of Skye is another location in Scotland with a shameful story of forced emigration; Barra, also, where the name Gordon of Cluny is still infamous. However, it would be wrong to think of the Highland people as living in some kind of rural Arcadia until wicked landlords came along. Nothing is that simple. The world was changing, the Industrial Revolution was impacting on lives - and even the Sutherland dynasty spent large sums of money in trying to find solutions to the issue of a growing population living on marginal land. 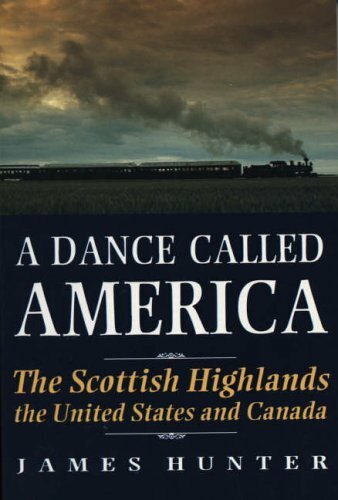 Were the Highland Clearances in Scotland’s history really ethnic cleansing or done to the native people ‘for their own good’? It all depends on your point of view. Finally, a kind of footnote. Though we associate the phase of cruel evictions to a historic period that lasted well into the 19th century, it is curious to note that even in the 21st century there are echoes of those times. In February of 2018 a petition was started through the pressure group 38 Degrees, drawing attention to the availability of large sums of public money for new forestry plantings in Scotland. This naturally attracts large private landowners. The petition specifically targeted the Buccleuch Estates. It is claimed they are not renewing some farm tenancies in the Scottish Borders in order to convert the land to forestry. Public money to the '6th-richest duke in the UK'! The 10th duke of Buccleuch is sometimes described as Scotland's largest single landowner with 280,000 acres (110,000 ha). Sometimes he is also described as the UK's largest landowner (though the puir chiel is only the 6th richest duke in the UK). Anyway, as he inherited something like £320 million after his dad died in 2007, he sounds quite comfortably off. Nevertheless, his estates will be benefiting from the funds. Oddly, this chimed with something I noticed once while exploring the wee connecting road between Yarrow and Ettrickbridge in an out-of-the-way part of the Scottish Borders. It's sometimes called 'The Swire' and is popular with cyclists - at least the ones who like pedalling uphill. We stopped the car at the watershed, sometimes known as 'Witchieknowe'. It gives a quite nice view across a lot of rolling and fairly featureless grassy terrain. A stone structure caught my eye. I strolled over and saw an inscribed stone. When I read it, I soon saw it was one of these forelock-touching 'grateful tenantry' type inscriptions to the wee-bit local lairdie (or heid bummer). I assumed it was Victorian in origin until I came to the date. Astonishing! 2005! A hand-build wall and seat as a 21st birthday present to the 10th duke of Buccleuch's son - one Walter John Francis Montagu Douglas Scott, aka then as lord Eskdaill, or he can have the earl of Dalkeith also as a label. I was amazed - I truly thought that in the 21st century, such toe-curling gestures of class demarcation had disappeared. Tenants were removed for sheep, then deer and now, perhaps it is to be trees? More information on the call to protect Scotland's' tenant farmers on that link. This piece on modern day clearances in Scotland from The Scotsman newspaper also of relevance. Is Skye worth visiting? A Scottish icon in itself, in spite of its sometimes rainy reputation it's hugely popular in the main season. They even tell stories of visitors being turned away at the Skye Bridge unless they had pre-booked accommodation. Sometimes, it seems, Skye is simply full up.